This carp lake contains at least 500 carp; this includes a good head of doubles along with a high percentage of fish weighing in excess of 20 pounds. The water holds at least twenty fish over 30lb and includes at least five different fish over 37lb, three of which have been caught over 40lb (two of these being ghosties). There is a good head of tench which have been caught to over 12lbs in the past along with pike and some spectacular shoals of Rudd. 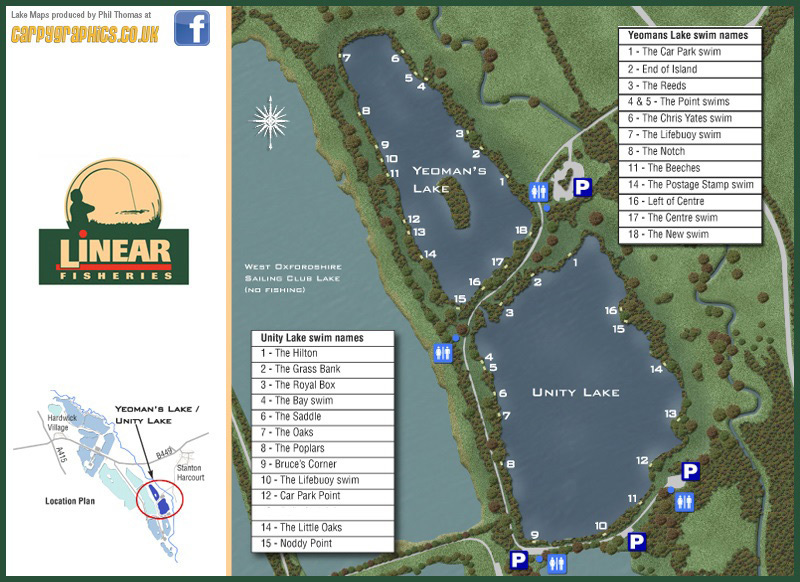 Next to Yeomans and the first car park, you will find Unity, which at approximately 25 acres is the biggest of the three lakes. Unity does not contain any islands but there are plenty of features on this water which is reed and tree fringed and contains approximately 500 carp including a number of ghost carp. The best ghost carp caught in recent years weighed 42.08 and is the new lake record; lake record for mirror carp is 45lb and for common 45.13. A high percentage of the carp present now weigh in excess of twenty pounds with at least twenty over thirty - three of which, at the right time of year, have been caught at over 37 pounds and two over 40 pounds. Including a number of ghost carp. Linear will continue to stock the syndicate waters when and wherever necessary with selected carp from their stock waters. A number of these selected carp will be introduced in 2017. The Guy Lakes consists of three lakes - Gaunts, Unity and Yeomans, all of which can be fished on a single syndicate permit. THE PRICE FROM APRIL 1ST 2018 IS £695 AND COVERS ALL THREE LAKES FOR A FULL YEAR FROM THE DATE OF JOINING - ON APPLICATION: LINEAR WILL ACCEPT SPREAD PAYMENTS OVER 12 MONTHS TO COVER THIS FEE. There are 10% reduction concessions for husband and wife/girlfriend and an adult with a son or daughter under 16 years of age. Linear will accept members who are under 16 years of age but an adult member must accompany them when fishing. The lakes are for angling members only although members may apply for very limited guest tickets. Guest tickets will only be issued from September 1st to March 31st. Linear will not be allowing more than two guests on the waters in any one day. Tickets will be issued on a first come first served basis and must be applied for in writing with payment at least two weeks in advance, please see rules.